Tiger Woods has won the 2019 Masters, and golf writers everywhere collectively sit back and wonder if they’d ever write that phrase again. Hyperbole is hard to avoid in times like these, and especially when involving Tiger Woods. The now 15-time major winner has a tendency to overcome even the darkest exaggerations. None of us thought we’d see him play golf again, but he did. There was no chance he’d ever contend in a tournament, until he did. Certainly, he’d never win again, but then he did. And now? Oh… and now. On Saturday, Hackett came by to watch the third round while Tatro was on the mend (although no doubt watching from his couch). We naturally fell into our normal banter about Tiger’s chances, along with what seemed like 30 other players within an earshot of the lead. “If-only’s” were offered regularly, and we’d laugh thinking about how incredible it would be if Tiger could somehow… some way…. When news hit that weather would push tee-times up to the early morning and that Tiger would play in the final three-ball group, our joking suddenly took a turn. This could actually happen. We might see something neither of us thought we’d see again. Could it be possible? Sunday’s early round was similar to what I remember when waking up on Christmas morning. You know, before we all became too “old” and “smart” to realize there was no man in a red suit who visited overnight. The impending real life responsibility of going to a family wake later that afternoon was forgotten for a little while, replaced by a few hours to simply sit, watch, and enjoy Masters Sunday. Chicagoland did see snow in April, however. Sometimes analogies need all the help they can get. We all know what happened next. By 1:30pm CT, Kristen and I watched as our golf hero, the man whose career we both watched for over 20 years, was on the verge of the impossible. 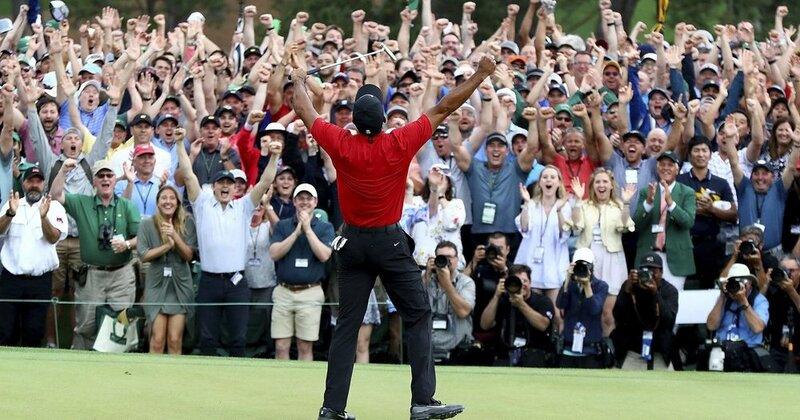 With arms raised and a roar louder than ever, Tiger Woods accomplished what couldn’t be done. With smiles on our faces, we cried. Based on Hackett and Tatro’s messages on our group text, they did too. Later, back in reality prepared to console family members and hide in the funeral parlor lounge with stale coffee and donuts, a buzz reverberated. A funny thing happens when friends and family know you “write about golf or something”; they want to make sure you heard about that golf thing that just happened. But everyone knew. It was understood. We all watched, even family members who never watch golf. My father-in-law smiled, we shook hands, and gave the obligatory fist pump (despite being slightly resisted due to sport coats). That is the impact of Tiger Woods. That is the impact of The Masters. We all knew about that golf thing that just happened.